African leaders and international dignitaries came to Ghana to pay their last respects to Kofi Annan, the first black African to become the UN secretary-general (1997-2006) and a Nobel Peace Prize laureate (2001). Annan died on 18 August in Bern, Switzerland. He was 80-years-old. Born in 1938 in Kumasi, Ghana, Annan joined the United Nations system in 1962 as an administrative and budget officer with the World Health Organization (WHO) in Geneva. He served with the UN Economic Commission for Africa (ECA) in Addis Ababa, the United Nations Emergency Force (UNEF II) in Ismailia, the Office of the United Nations High Commissioner for Refugees (UNHCR) in Geneva. At UN Headquarters in New York, he served as assistant secretary-general for human resources management and security coordinator for the UN system (1987-1990) and assistant secretary-general for programme planning, budget and finance, and controller (1990-92). Before being appointed secretary-general, Annan served as assistant secretary-general for peacekeeping operations (1992-93) and then as under-secretary-general (1993-96). During his two-term mandate as head of the UN, Annan initiated a reform plan to make the organisation more efficient. His other priorities included restoring public confidence in the UN, combating HIV/AIDS, especially in Africa, and ending human rights abuses. In 2005 Annan was at the centre of a controversy following an investigation into the oil-for-food programme in Iraq. Following his mandate as UN chief, he remained committed to promoting development. In 2007, he founded the Kofi Annan Foundation whose mission is to promote peace, sustainable development, human rights and the rule of law. He also became chairperson of the Alliance for a Green Revolution in Africa (AGRA). In 2012, Annan resumed his work as a top UN diplomat when he was appointed UN joint special envoy for Syria and the League of Arab States. 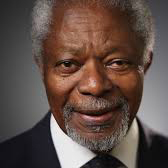 Annan was known for his “code of soft-spoken diplomacy.” In 1998, Annan said, "You can do a lot with diplomacy, but of course you can do a lot more with diplomacy backed up by fairness and force." He later shared his experience in a book, “Life in War and Peace,” which was co-authored by Nader Mousavizadeh and published in 2012. An economist by training, Annan completed his undergraduate work in economics at Macalester College in St. Paul, Minnesota, U.S.A., in 1961. He did graduate work in economics at the Institut universitaire des hautes études internationales in Geneva. Mr Annan also held a Master of Science degree in management from the Massachusetts Institute of Technology.